Leading Manufacturer of sunth powder from Ahmedabad. Sonth is nothing but fresh ginger, that belonging to the Zingibaraceae family and its latin name is Zingiber officinale. It has a strong aroma and pungent flavour. and it used in spices and masalas for gravies, curries, marinades, stews etc. In India it is available as dry ginger, sunth, sonth or soonth powder. Pooja Traders is Ahmedabad based prominent Sunth Powder Manufacturers in India. We provide all Types of Indian Cooking Spices Powder like Sunth Powder, Ginger Powders and so on. we offer best Quality Soonth powder in india to our valuable customers at very reliable prices. 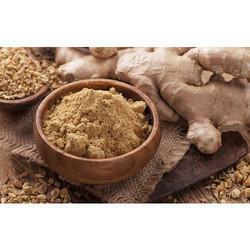 Dried ginger powder is used in making spices and masalas, which are used in gravies, curries, marinades, stews etc. It is commonly used to flavour gingerbreads. A special tea made out of dried ginger powder. Helps in Weight loss.Improve Metabolism. Helps treat the symptom of common cold. Looking for Sunth Powder ?